We’ve had hoar frosts and a smattering of snow this week, not weather conducive to gardening, luckily today it’s warmed up a bit and everything has thawed. The little patch of snowdrops by the pond is looking very pretty. A few stately homes round here open their gardens at this time of year for people to see the snowdrops. My WI is off to Goldsborough Hall in a couple of weeks time and they have a huge display. For me, this time of year is all about hope, winter is passing, the days are getting noticeably longer and there’s shoots appearing all over the garden, bulbs, perennials and buds on trees. They may only be small, but they’re starting, spring will soon be here! 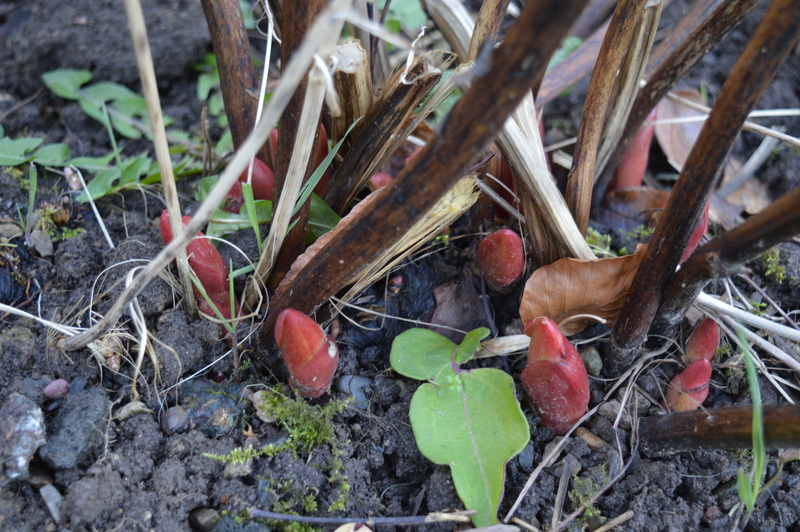 These big red buds are the shoots of a peony. 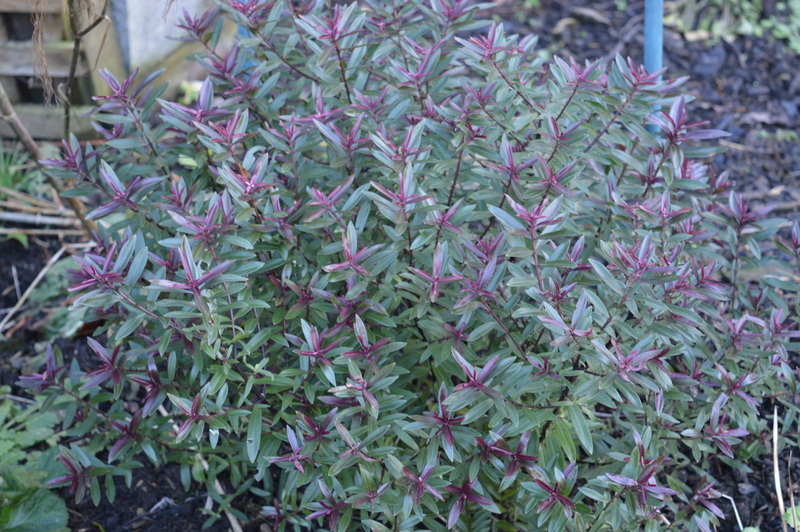 Hebe’s a great at all times of the year, there’s the flowers in the summer and the foliage the rest of the year. I’ve got several of diffent sizes and colours. 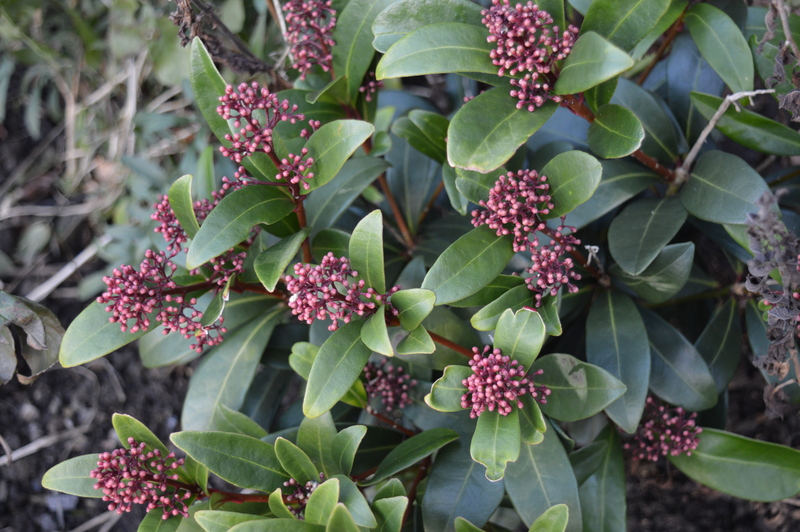 This one has reddish-purple tinge to it’s leaves and will (hopefully) be covered in purple flowers in the summer. This entry was posted in Garden and tagged Winter Garden. Bookmark the permalink. 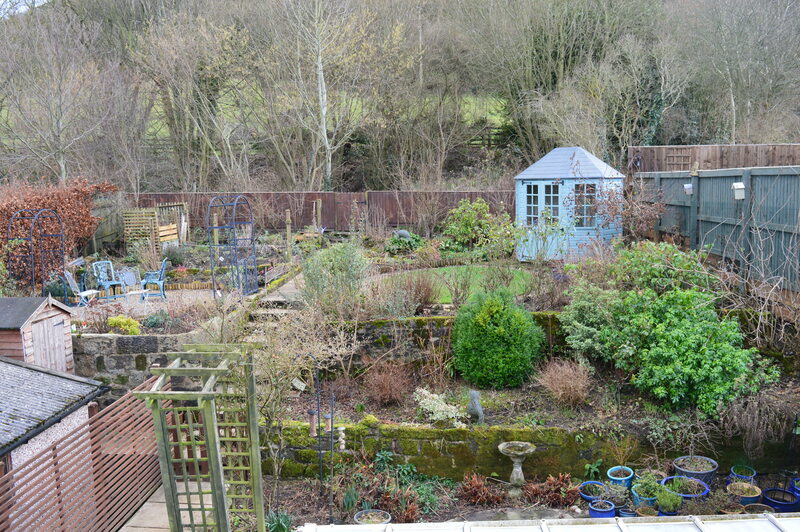 Glorious view of your back garden, even in “bare bones”season. Thank you! Know your WI will have a great time looking through that home and garden. Love the look of the garden – the only down side is that I don’t live near enough for a wander around! 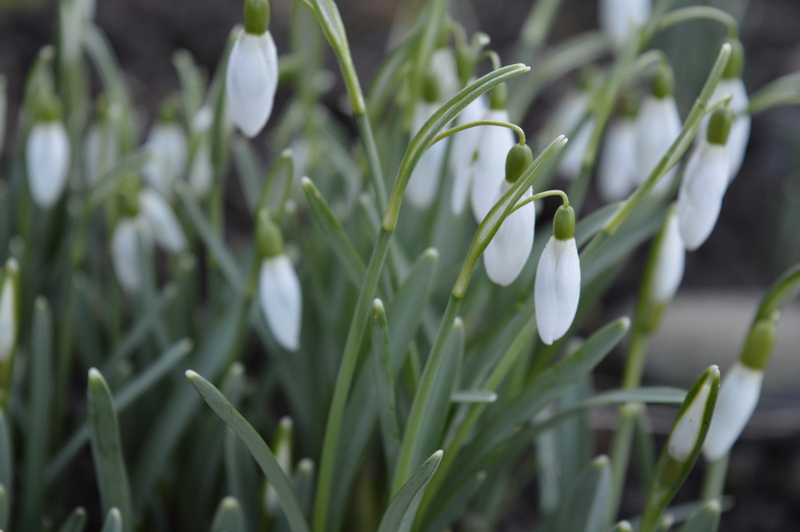 I want snowdrops, lots of them, but I think we are too cold. I’ll have to check! Your garden is going to burst forth in spring, especially after all the care you gave it this past year! Your garden has good bones. It still looks inviting during winter. Love that mossy wall. I think all of us gardeners are looking for signs of hope. The only thing sure is Spring won’t pass us by whether it is early, late to arrive or short lived..
Just fabulous and what a view!